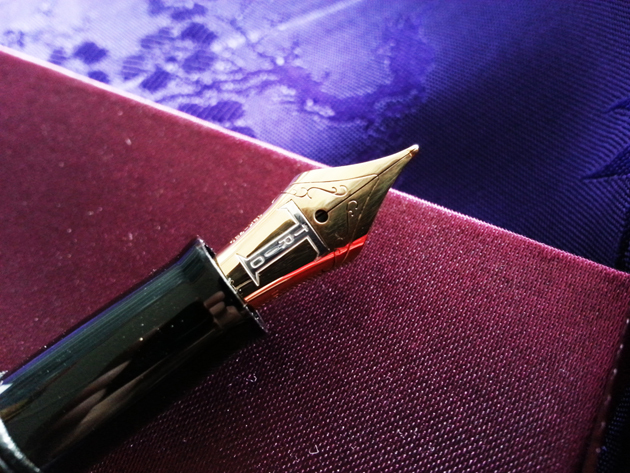 This is my first guest post and I decided to write it on the Fountain Pen Day website as a celebration of Fountain Pen Day 2014! I received a beautiful pen as a gift last year but never got down to reviewing it until now. Of course, we have to save great things for great occasions, eh? 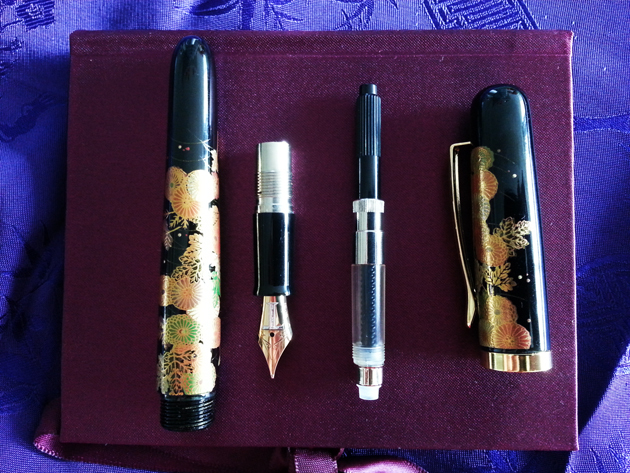 Which pen have you saved specially for use on Fountain Pen Day? 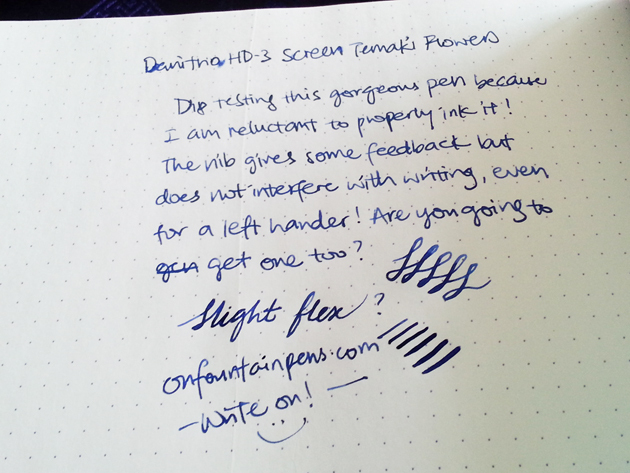 Today you will read about the Danitrio HD-3 Screen Temaki Flowers fountain pen. Now that’s a mouthful to speak off all at once, so I’ll just refer to it as the “Danitrio Flowers” for the rest of the post. Just look at this beauty! 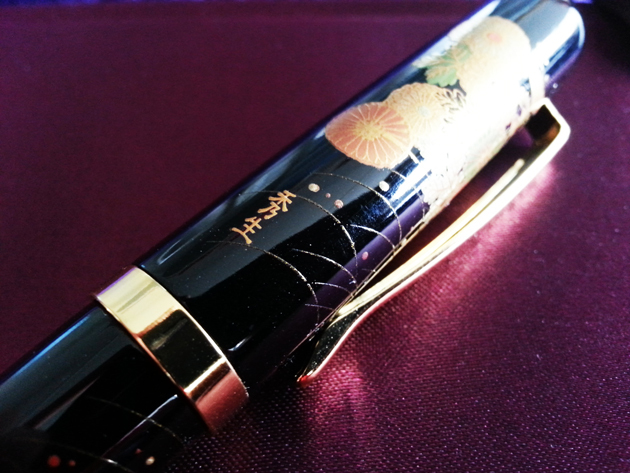 I have never ever owned such a wonderful-looking fountain pen! In fact, I would never have had a chance to own this pen because of the steep price, and getting it as a gift is so exciting for me. I had first heard of the Danitrio brand from a Singaporean fountain pen friend who lives in Australia when he came over to visit. I’ll have to say that I was very impressed with the pens that he’d showed to me (of which I can’t remember the names — I’m never good with names). Later on, my affinity with Danitrio increased as I was invited to be the master of ceremonies of the Southeast Asia Danitrio Maki-e event in Singapore last year. I was totally wowed with their range of pens! All so beautiful, I wish I could have all of them! Anyway, I digress, and let’s get back to the Danitrio Flowers. 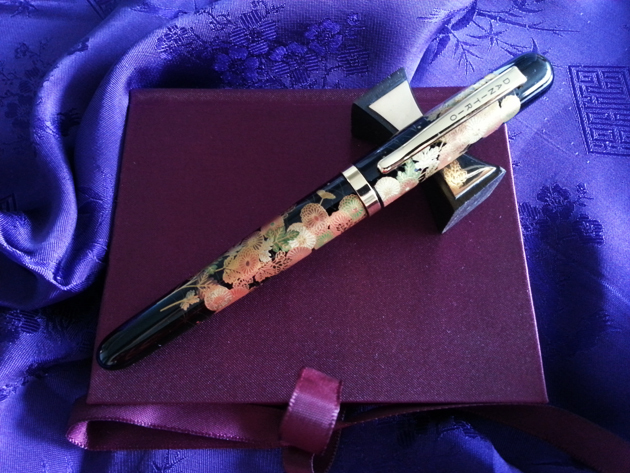 This pen uses the Screen Temaki technique, which is a kind of silk screen printing method, to form the design onto the pen body. Although also a very delicate method, it is different from the Maki-e technique. Don’t be confused between the two terms! On the cap there is a little signature in Japanese kanji of the artist’s name: 秀生 (Hideo). I don’t know Japanese, but the Chinese language have the same characters, and while the meaning could be different, my Chinese interpretation of this name is very positive. On that note, I suppose the naming of the pen “HD” is very likely an indication of the artist’s name, Hideo. Just look at the very fine strokes on the pen cap! The nib is an 18K gold nib and there is a big silver “T” on it, with the engraving “TRIO” down the vertical stem of the T. I felt this design a nice modern-looking contrast to the rest of the pen, and there are fine swirls along the “V” shape of the nib to make it not too boring. This nib is fine-sized and semi-flexible. Dismantling the pen was not difficult: just unscrew the cap, unscrew the barrel, unscrew the converter. Yes, everything works just by unscrewing! The cap has a nice golden clip on it and actually screws on pretty firmly even though I did not screw it on with too much force. It takes a tiny bit more strength to unscrew the cap than you might have remembered screwing it close: just enough for you to be conscious of it, but not so much that it becomes difficult to unscrew. It comes off fully in 1.5 revolutions: not too annoying, but not quick either. 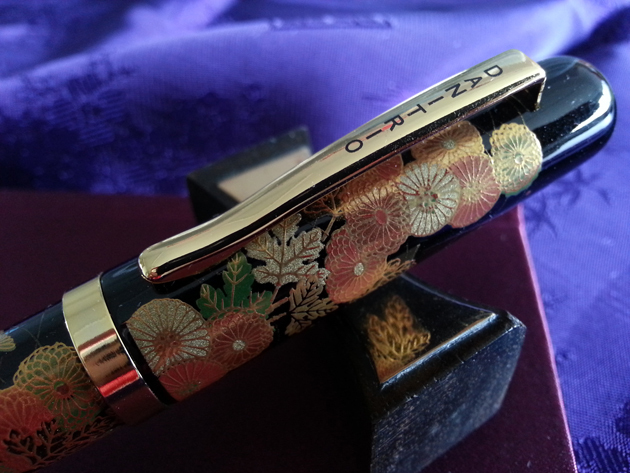 Not an issue — such a beautiful pen is meant to be savoured slowly! The threads, be it between cap-barrel or section-barrel, do not feel very smooth. You can actually hear a little rustling sound while unscrewing which is indicative of the friction, but it is not gritty. And yes, you read right in my previous paragraph — the converter fits in via threads as well, instead of being friction fit! That is able to to keep you reassured that your ink is very unlikely to leak out. The converter that comes with it is normal-looking, but from the shape of it, I do believe an international cartridge would be able to fit in as well. Overall, I think this is a really nice pen to have, but I haven’t written enough with it to judge whether it is a really good writer or not. I just thought that the price was a little steep, but even if I had to pay for this pen myself, I’m not sure if I would be able to resist it!